Nice cowboy jackets and hat set make your pet look so cute and adorable. Let you have more fun and memories with your little ones. When you take your cat or puppy out for a walk, you will definitely be the center of the attention. High-quality polyester fiber material, very soft to the touch. Suitable for all sizes of your smaller pets, and there is a belt that can be adjustable. This complete set of the costume has been stitched to prevent wear and tear and are both machine washable. Before buying, please measure the size of your pet. Denim jacket and hat set, the funny costume will make your cat or small dog look so cute and adorable. Cute costume designed specifically for cats and puppies, soft fabrics provides comfort. 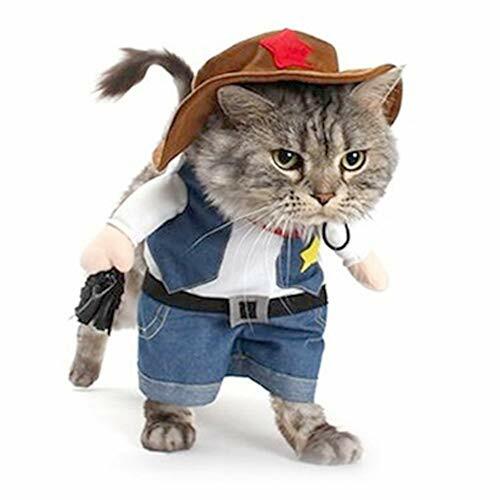 There is a pair of faux arms makes your pet look like a cowboy, very funny and adorable. Suitable for Halloween, Christmas, Easter, Thanksgiving or party, it will be a perfect gift for any pet owners. Neck circumference: 9-12.5 inches. There is a belt in pet costume that can be adjustable. If you have any questions about this product by Meihejia, contact us by completing and submitting the form below. If you are looking for a specif part number, please include it with your message. All Weather Neoprene Paw Protector Dog Boots with Reflective Straps in 5 Sizes! (Lg (3.5 in.)) Travel Zipper Case Included!